The beginning of the HTML file for this extension contains the standard document header information and a title tag that puts the words Script Editor in the title bar of the floating panels. Create a new blank document. Save the file as scriptEditor.htm in the Configuration/Floaters folder. selectionChanged(): is a script marker selected? 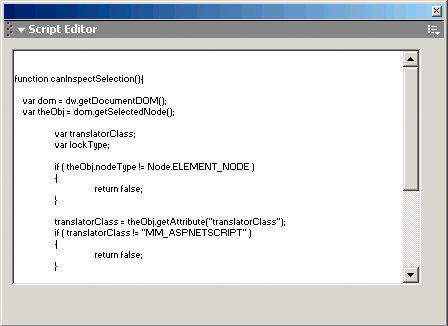 Open the file scriptEditor.htm that is in the Configuration/Floaters folder. Enter the following code in the header section of the file. 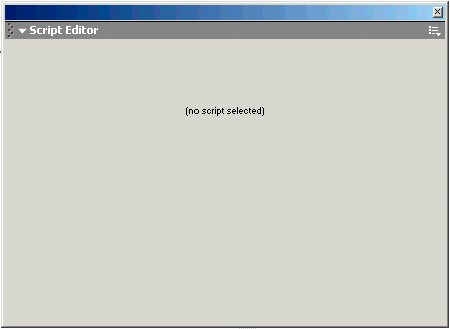 Open the scriptEditor.htm file that is in the Configuration/Floaters folder. Open the menus.xml file in the Configuration/Menus folder. locate the tag that begins <menuitem name="Tile _Vertically" and position the insertion point after the closing /> of the tag.